YSL Golden Gloss in #10 - Golden Peony: review & swatches! Time to review something a bit more high-end this time! Namely, a lipgloss by YSL (which if you didn't know by now is one of my favourite brands when it comes to lip products)! 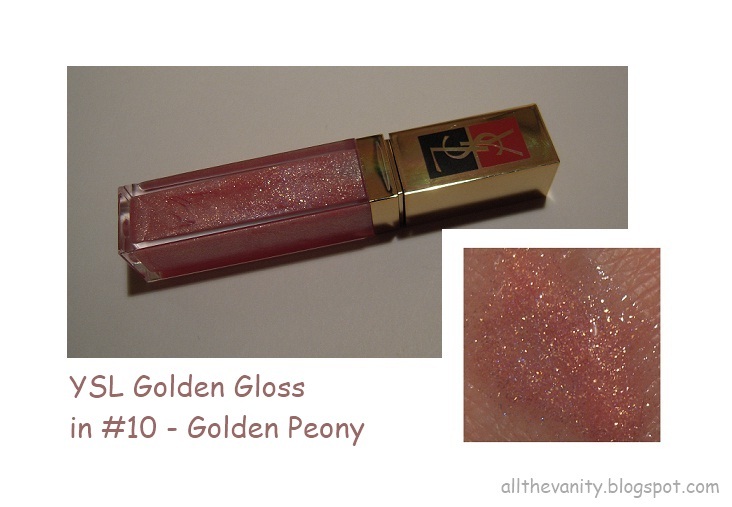 YSL's Golden Gloss in No 10, Golden Peony, is a shimmering, light neutral pink lipgloss. Shimmering being the operative word here, because, let me tell you, the amounts of golden shimmer contained in this lipgloss are not for the faint-hearted! It even shows up on these photos and, as most of us know, catching the shimmer on pictures is not the easiest task - so, you can only imagine how that translates in real life. Here's a few more swatches of it. From what you can see, it applies on the sheer side, which is a bit of a let-down, however the golden flecks are still much noticeable! Like other YSL Golden Glosses, I found that it applies smoothly, has a nice mango scent and is moisturising, with moderate stickiness. One thing that I recently(!) discovered is that all the Golden Glosses by YSL contain 0,2‰ of 24 ct gold - now, that is a miniscule amount, but it definitely adds to the whole luxurious feel! Obviously, the biggest disadvantage of these lipglosses is the price. However, if you're looking to treat yourself to a super (and I mean super) shimmery lip product, well, do keep this in mind! I ended up getting rid of mine. I felt they didnt last long enough on lips so as much as i loved the sparkle.. the watery texture just didnt do it for me. I want more color!!! 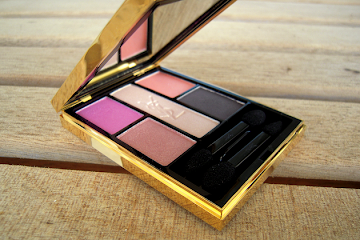 I think ysl have excellent shimmer standards which are also unique. But man I hate the brush! Totally uncontrollable. For smt lower end but very shimmery I recommend radiant"s pink pearl in 45. Has a sponge as well. For shimmer I d go for chanle and ysl and for frosty gloss with lasting quality I d go for guerlain. @λειντι ντι: I'm used to the lip brush by now... it doesn't bother me at all! I so hear you on the price thing, but the YSL glossies are pretty top notch! Have you checked online to see if you can get a better deal anywhere else? Otherwise i'll have to consider opening an online e-beauty store in Greece! 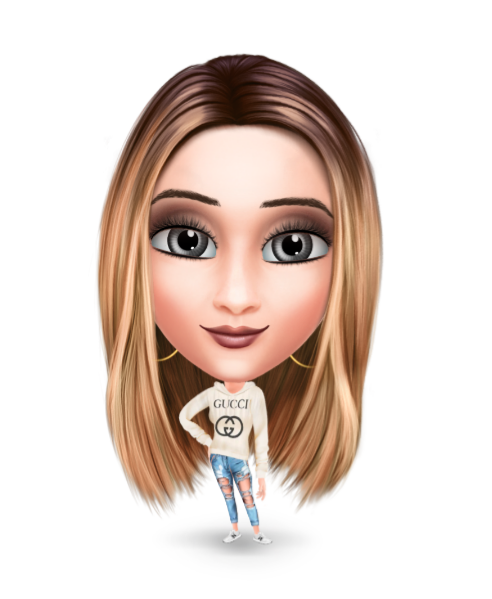 Great review Hun! Oh gosh I love shimmer in lipglosses. It's so glam and really brings focus to the lips. 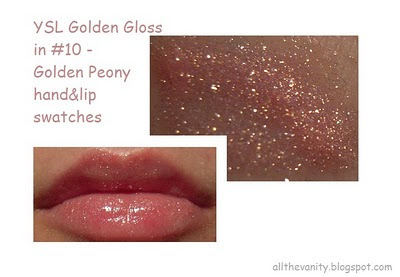 That's super cool that the YSL lipglosses have a bit of 24 ct gold in them! It certainly does add to the luxurious feel (maybe slightly justifying the price to our bfs LOL). I actually kind of like how this is sheer because you can layer it on top of any other lipstick or plain gloss and get shimmer (great esp for evenings/nights out). great review. it looks gorgeous on the lips. i have never tried anything from ysl but really want to try one of their rouge volupte lipsticks. @A BRIT GREEK: Actually, a greek beauty e-shop would be amazing, would come really convenient! As for YSL availability (and Chanel and Dior etc), I only know of Strawberry Net, although I 've never purchased from them (I hear there's been a few concerns regarding authenticity)! Georgina on a weekend? huh? please clarify.. lol. I live for glossimers. I must have 20 Chanel colours. HAHAS! ok thanks :) yeah maybe I'll do a post about them. It's been a while.. always nice hearing from you. Hope 2011 is already treating you well. 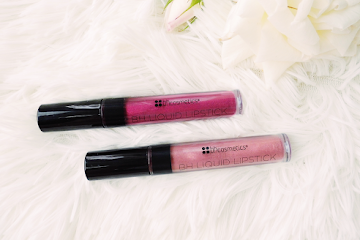 How long do these glosses last on your lips? And do they disappear leaving behind the glitter? That's the ONLY thing that annoys me about glittery glosses! I must admit I have a fear of shimmer on my lips, probably because of an old shimmery gloss that made my lips look dreadful... This one looks nice, though. Very classy and grown-up, if it makes any sense! Interestingly enough, I recently attended a fash biz forum event and there was a lot of talk about e-commerce! Thanks for letting me know re: Strawberry! Let me know if you have any comments/ideas/suggestions. @A BRIT GREEK: So, if you have the idea and the know-how, what are you waiting for woman? Greek beauty shopaholics could use you! Haha!